Barbara from Creative Culinary and Jenn from Jenn’s Cuisine have teamed up for a great cause. Their idea to have bloggers participate by cooking something comforting to bring to those in need is a brilliant one, not to mention, heartwarming. As someone who was right in Sandy’s path and has seen the devastation that she’s caused firsthand, it’s even more special. During the hurricane I baked a ham and brought much of it to family/friends. Naturally, I kept the ham bone, and searched for something different (and easy) to do with it. This recipe was exactly what I was looking for. Ironically, I read about this initiative while the meal was cooking away in my crockpot…perfect timing! It really is pure comfort in a bowl. Plus, you can reheat it on a gas stove when your power is out…which, as many of us in this area now know, is imperative when you’re in the dark for over a week. 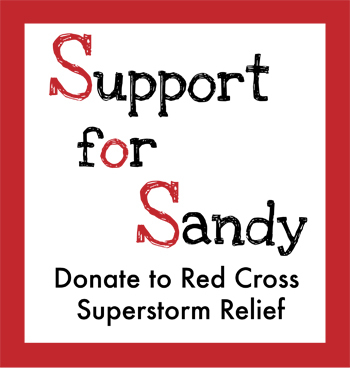 Participating bloggers will be tweeting using the hashtag #FBS4Sandy…please join in the conversation! And please visit Barbara and Jenn’s blogs to check out the link party that includes all of the warm, comforting dishes. Hope all of my neighbors are staying safe…Jersey Strong! 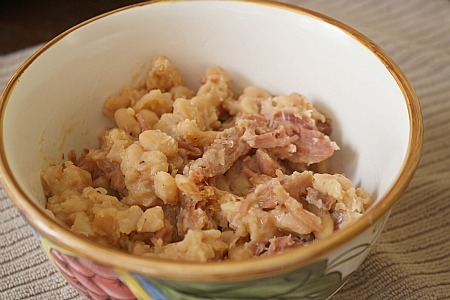 This entry was posted in beans, crockpot, main dishes, pork. Bookmark the permalink. Thank you so much for joining in and participating to spread the word about how to help relief efforts for the hurricane damage and those affected. I’m glad to hear that you are safe, and would love a bowl of this – it looks like a wonderful dish of comfort. I love how you made sure to use every piece of that ham! !